One of the biggest challenges for us, since the conception of the premix over a decade ago, has been to explain in a few words what the premix is. Cat owners are familiar with dry and canned foods, frozen raw foods, homemade diets, and supplements – but into which category does our premix fall? In essence, our cat food premix is everything but the meat for making a homemade, raw meat diet. Hence its description as PRE-mix. Its formula is based on Feline Future’s internationally popular do-it-yourself cat food recipe first published nearly 15 years ago. When Feline Future´s busy readers asked to make a cat food for them rather than teach them how to make one, Feline Future decided to invent the homemade cat food premix rather than make frozen raw cat food for sale. Over the past decades the formula of our cat food premix has naturally evolved with our growing understanding of the cat’s needs and our customer’s wants. All the ingredients you find in our premix are what you would otherwise buy as groceries, capsules, powders, and pills to add to raw meat as instructed in a recipe. Since we have entirely specialized in making the cat food premix, and have devoted the past ten years to it, you will find ingredients in the premix not even available in the best health food store – making our TCPremix a very special product! The cat looks, functions and acts the way it does because it hunts to eat. It is a perfect predator and true carnivore. The recent replacement of the cat’s natural dietary habits with commercial canned and dry cat foods represents a true evolutionary dead end. In their sheer nature these products vary so greatly from what the cat is naturally adapted to eating, that it is nearly impossible for the cat to maintain good health when eating these products as the sole source of sustenance. The ideal diet for your domestic feline friend would resemble that of a small wild cat. A variety of small prey animals, such as rodents, would entirely meet all of the cat’s nutritional needs. Since such foods are hardly an option for feeding the family cat, the raw meat diet offers a practical and satisfactory alternative to the cat’s natural diet of prey. The TCPremix formulas are a powdered blend of essential minerals, vitamins, and amino acids developed to assist caregivers in the easy preparation of a nutritionally sound homemade cat food. 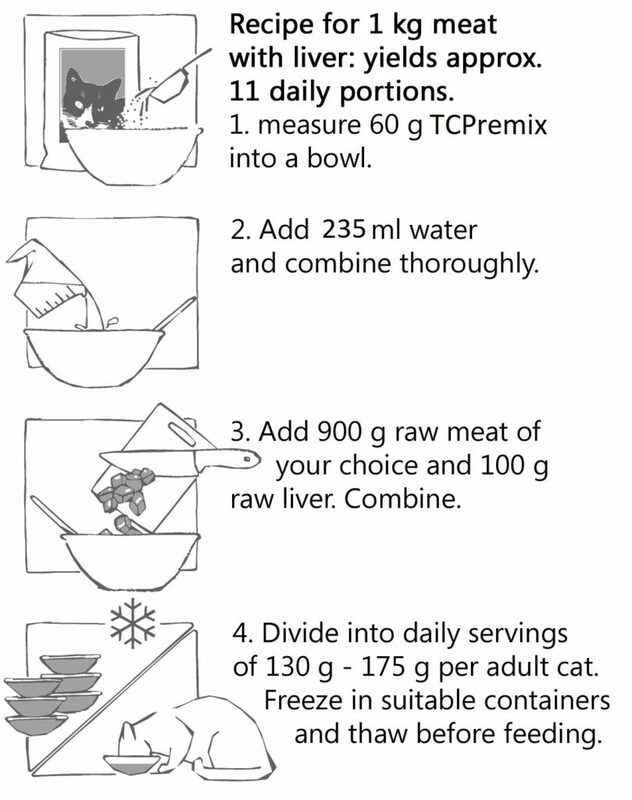 With TCPremix preparation of a homemade raw diet is as easy as 1,2,3 … just ad water and meat. The resulting cat food mimics the nutritional composition of a mouse, and is recommended as a staple diet for cats of all ages. We recommend, that TCPremix is combined with RAW meat, but cooked meat can be used in some circumstances under the discretion of the caregiver. The full potential of health benefits can, however, only be achieved using raw meat, because raw meat is nutritionally more complete and digestible. Cooking “denatures” many proteins and fats – making them unavailable to your cat. 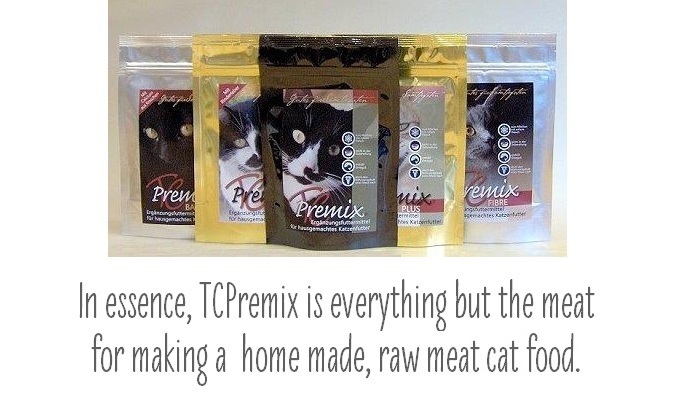 When feeding the raw meat cat food you prepare using the TCPremix, no supplementation of any kind is required. This diet is also an excellent complement to the wellness plan for ailing cats. It finds application as the staple diet especially for cats in treatment for Lower Urinary Tract Disease, Irritable Bowel Disease, and Obesity. For best results, we recommend that all dry and/or canned cat foods are removed from the cat’s meal plan, unless the caregiver sees an absolute need to retain them as part of his or her cat’s diet.